I am losing my mind. Actually, that tense is wrong. Some parts of my mind seem to already be gone. Like anyone else, I hate making stupid mistakes. For some reason I can except that I will be wrong on many occasions, for I am only human, but I do not accept the equally human quality of simple mistakes. To be fair, I am closer to acceptance these days. Where I would berate myself aloud in the past, I now typically sigh and go back and fetch it, pick it up, put it back together. This morning, I just couldn't seem to get out the door. I was meeting a buddy for a short bike ride, and just before leaving I realized I had forgotten my GPS watch (the ride doesn't count unless you track it). Back upstairs, grab it and go. As I sat in the driver's seat and went to put my key in the ignition, I realized that there was no bump in my back pocket where my wallet should be. Shoulders slump, back upstairs, unlock door, find jeans, resist smacking forehead, lock up and finally get on the road. As we pulled out of the park, I looked down and realized my bike pump was not on the bike. For some reason, I just didn't want to turn around one more time, and kept pedaling. I have one of those CO2 inflators stashed in my bag, but they never seem to work very well, but I decided to risk it. The ride was great, hilly but uneventful (no flats), and the fog burned off to reveal a beautiful day. It was just Mike and I this time around, and I don't know him as well, so we rode at the same pace and chatted the miles away. Back at the truck as I was loading my bike on the rack, I set my gloves on the bumper. As I did, I thought to myself, "Don't forget them". I had left a bike pump there a couple of months ago at the same park, and drove away, losing it somewhere on the road. Of course I did the exact same thing with the gloves today. Not ten seconds had gone by from setting them down to load the bike, and the thought and reminder were gone. I didn't realize my mistake until hours later. Since I can't afford to replace them right now, and I have another early bike ride tomorrow, I drove back to the park just before sundown in hopes of finding them. I walked the roads, but didn't spot them. I walked into the park to see if a good Samaritan had set them somewhere as an impromptu lost and found. I found mismatched single gloves, one on a sign and another on a bench, but mine were nowhere to be found. As I drove home, I reasoned that I could use the running gloves that my parents had bought me for Christmas. They wouldn't protect against the wind as well, but they were still relatively warm. I went to grab them this evening because I knew I would forget them if I left it until morning, but of course they were nowhere to be found either. I looked in every logical spot, and then in places that made less and less sense. Cushions were overturned, kitchen cabinets searched, desk drawers opened, all to no avail. I knew I had them just a week ago for a chilly morning run. I actually checked my calendar to see what I had been doing last Saturday, and there it was. Some of us had gathered to plan out what biking events we wanted to do this year. The gloves were probably sitting at a friends house, in the grocery bag I had left/forgotten (rather large pattern developing). A quick text confirmed that they were there (along with my water bottle), at least confirming that my brain still works on some level, if only a week too late. As I walked back to my car earlier this evening, scanning the road and grass one more time, I could feel the self-anger tickling at my brain, but it was overwhelmed with a shoulder-sagging feeling of exhausted defeat. A form of acceptance, I guess, but it didn't feel that much more healthy. 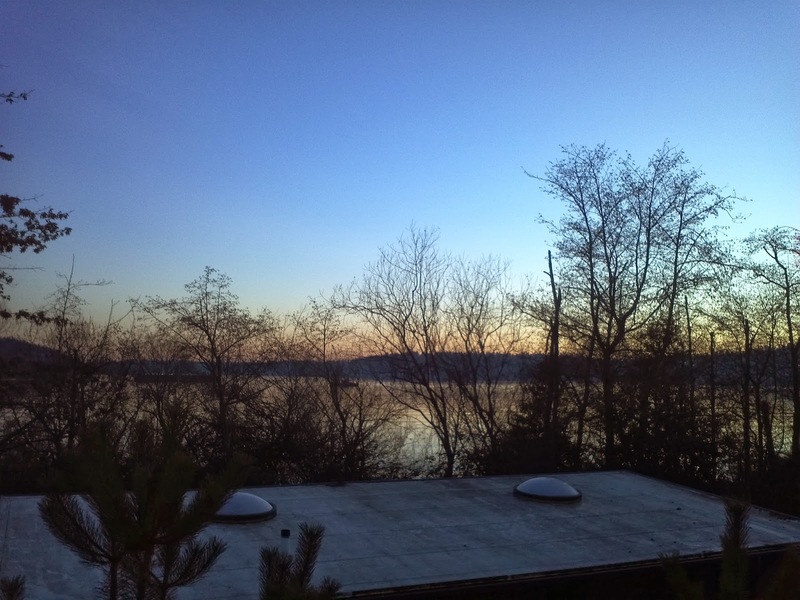 To try to turn my mind and the night around, I stepped up onto a platform to look at the fading sun over the lake. Overall, it had been a good day. Even before the bike ride, I had made it out for a three mile run along the Sammamish Slew. I had time in between to make myself a full, weekend kind of breakfast, and the sun and company in the afternoon had been refreshing. I'm out $50, my fingers will be cold tomorrow, and I still need to get to Seattle to pick up all the stuff I have left behind. I don't know what it will take to stop being so forgetful, or if this is just a taste of what is to come. Still, there are moments like this that make the stupid mistakes seem small and unimportant. New Year's Day is usually a day of recovery. After whooping it up ringing in the new year the night before, and after weeks of holiday madness, a date with your couch in your PJs, doing nothing more active than watching the 78 bowls games is usually in order. Not all of us are so smart. New Year's Eve was a long night as usual. Well, I suppose "usual" has changed over the years. For so many years, the last night of the year was spent in a bar with friends. It was the bar in the restaurant where we worked, and after our shift (hopefully before midnight) we joined the growing crowd of co-workers, spouses, partners and other friends that had come down to join us. Even though most of us were essentially hanging out at work, those blowout evenings were some of the best. New Year's Eves aren't quite as wild as they were back then (still missing a few hours from one of those nights). Lately the groups are smaller, fewer drinks are consumed, and the pillow is hit a little earlier. This year I spent the evening over at my friend Mark's house in a crowd of fifteen or twenty. Mark is one of those friends from the restaurant days a decade ago, and has an energy and sincerity that people flock to. It was a fun night, and I didn't make it to bed until sometime after 2:00am. This year, there was no date with the couch on the morning after. 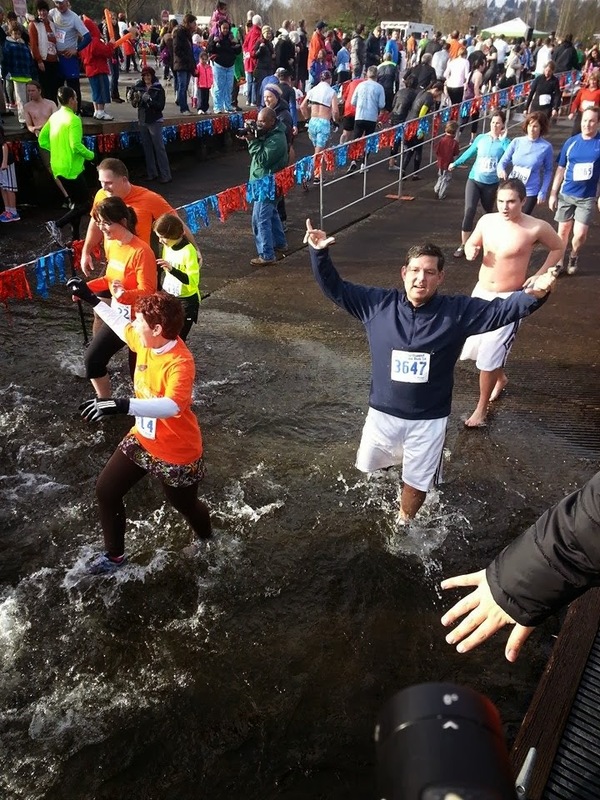 I joined Joe and Tom in starting the year off with a splash at the Resolution Run and Polar Bear Dip 5k. 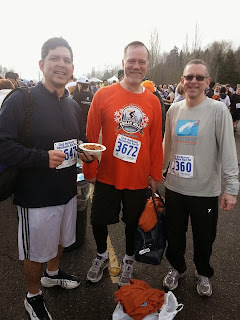 I had run the event a couple of times with my old running crew, but it had been years since I started the year actively. 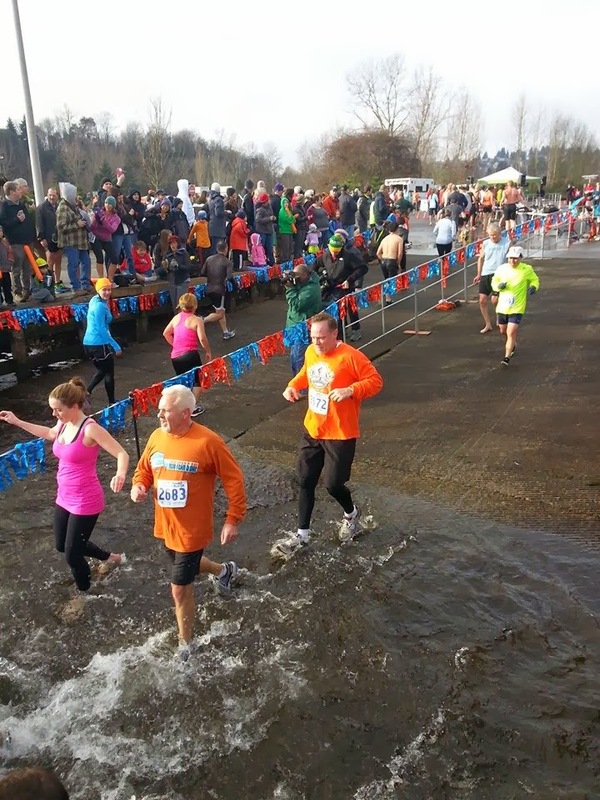 The 5k runs around Magnuson Park, and just before the finish the route splits into "Dry" and "Wet". 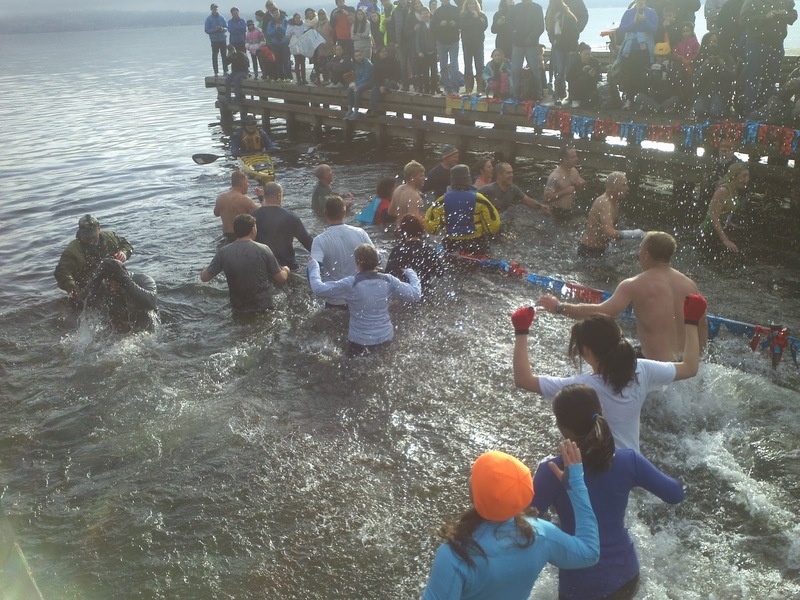 The "Dry" folks (weenies/smart people) head straight to the finish line, while the "Wet" runners take a left to the boat launch. I have been reasonably active the past few months, but there has been a bit less running since I wasn't training for anything in particular. Add to that a small hangover and a short night's sleep, and I was just looking to have a fun run and not lose my cookies along the route. Once I started running, though, I felt pretty good, and ran along at a good clip. As I approached the split, I will admit that the "Dry" lane did look kind of tempting, but I had committed and would never hear the end of it if I wimped out. I hit the boat ramp and waded into Lake Washington. 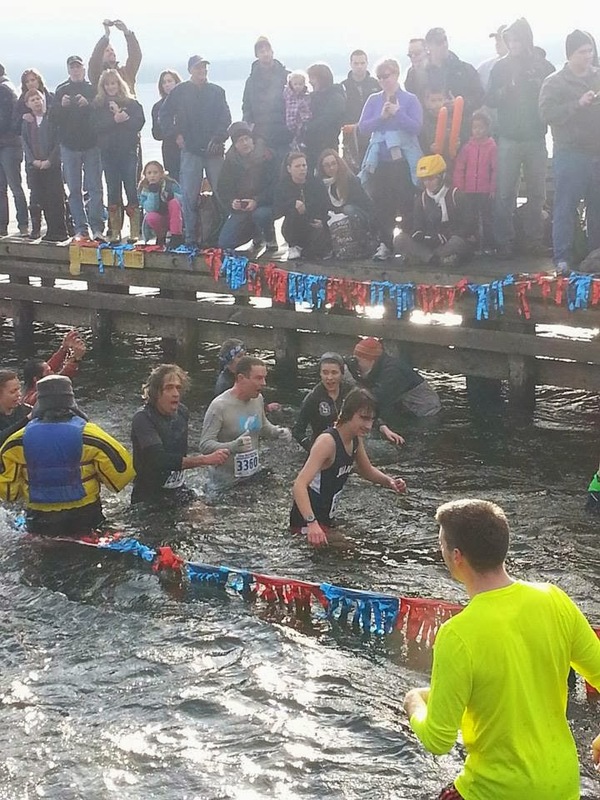 Lake Washington hovers around 45 degrees in the winter. In many years, the lake is actually warmer than the air temperature. This year, they were about equal, so you would think that the shock would be pretty minimal. However, after running three miles, you are definitely warmer than average, and of course water is a much better conductor of heat (or lack thereof). As I waded into the lake, it didn't feel that bad, and was actually refreshing to tired legs. 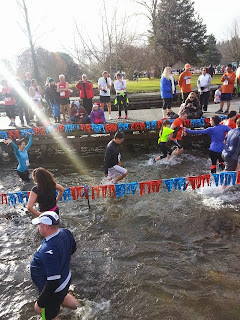 By the time I made it to the turn-around, though, the euphoric warmth was wearing off, and I knew I had to keep moving. I dunked in completely to make it official, and the quick shock took my breath away. I pressed on and ran toward the finish. 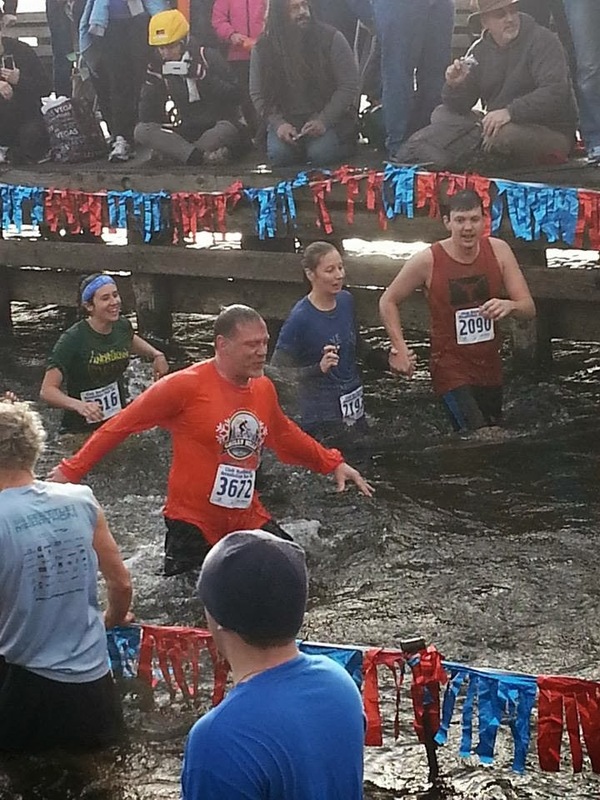 I ended up running a good time, even with the side trip into the water. I crossed in just over 22 minutes, which isn't that far off my personal best. As I walked around and caught my breath, a guy came up and gave me sort of a high-five hand clasp and said, "Not bad for a couple of old guys." It was a pretty good time, and I smiled and congratulated him as well, but then thought, "Wait, am I an old guy now?" Crap. I ran back to the dock to see Joe and Tom take the plunge. Tom's wife and son were there cheering the runners on and taking pictures. 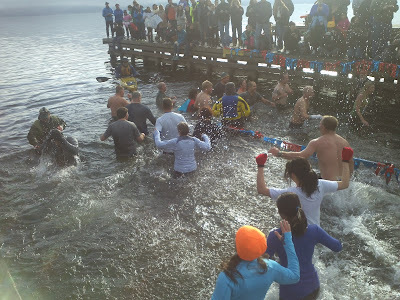 As silly as it is to run into a lake on New Year's Day, it is even crazier but more awesome to stand in the cold and watch the knuckle-heads do it. I am always thankful for people who come out. Afterward, we found some semi-dry clothing and talked about plans for the year over lunch. 2013 was a big biking year for the three of us. There will probably be fewer biking events this year, but maybe a bit more running to balance it out. I have been doing this biking and running thing for more than a decade now. 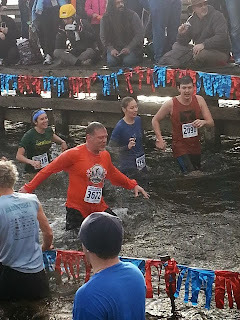 I am in better shape in my forties than I was in my thirties, and I feel that beyond the grey hairs (and finish line comments) that it has kept me feeling a bit younger than my years. It has also led to great experiences and adventures with friends, both old and new. 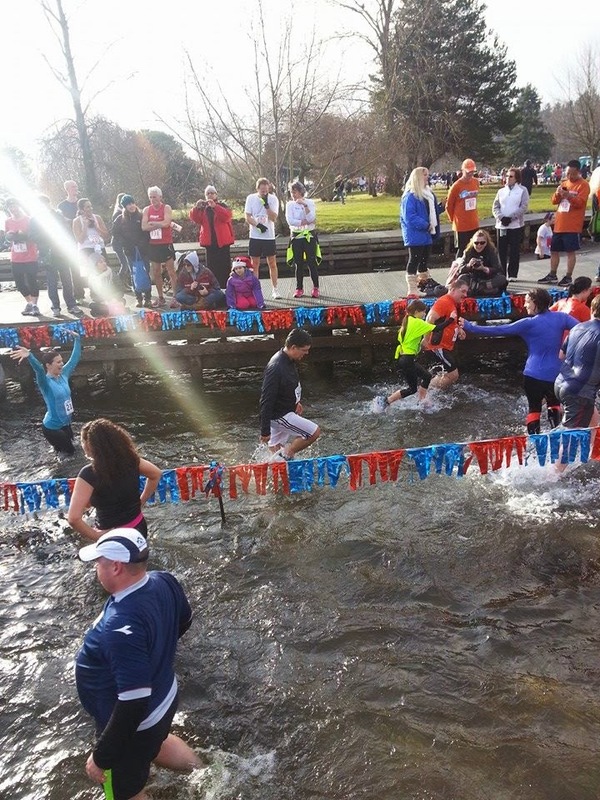 Tami said semi-seriously years ago that she took up running just so she could see her friends as weekends began to fill with events. It is easy to drift apart, and I think that sharing these common pursuits not only strengthens our connections, but they strengthen our bodies as well, and might just keep us around to enjoy our friendships a bit longer. Not a bad way to start the year.